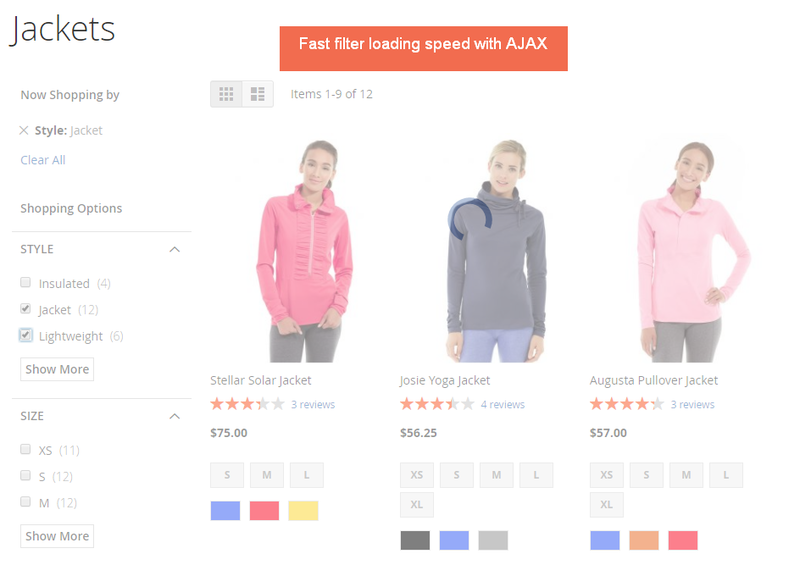 Magento 2 Layered Navigation Multi Select Extension with Ajax Filter creates a smart product filter to help your customers find their desired items easily. The core aspect of an easy-to-use, outstanding online store is the ability to show customers their desired products instantly. And a flexible Magento 2 Layered Navigation Multi Select Extension with Ajax Filter is the key to this problem. The extension by BSS helps your buyer filter products by attribute in Magento 2. The fast-loading Ajax layered navigation allows customers easily search for any items with multi select among a wide range of attributes. Say goodbye to the default layered navigation in Magento 2, where your customers can apply only one filter at a time. 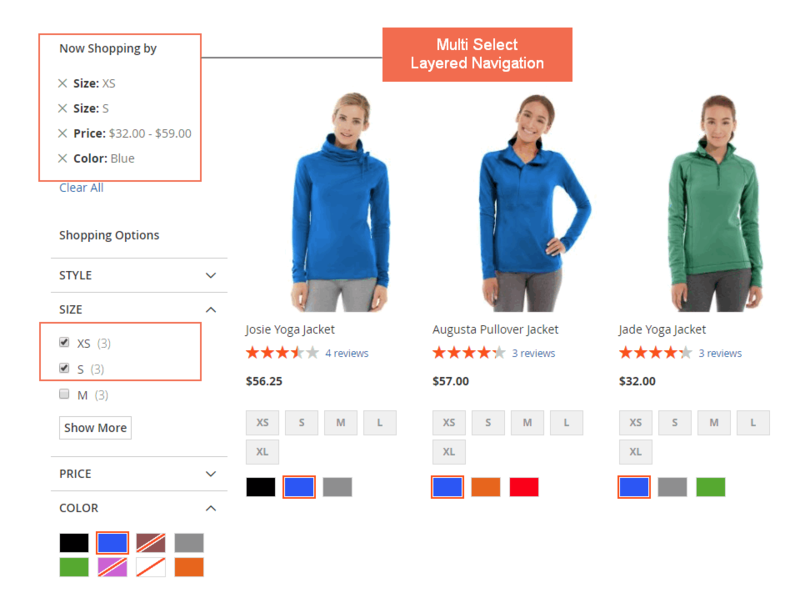 Magento 2 Layered Navigation Multi Select allows buyers to easily select multiple filter. The multi select layered navigation can be applied for various product attributes with many options. The extension using AJAX Magento 2 Layered Navigation to show product filter result without reloading the entire page. With the help of AJAX technology, items matching selected options will be updated in an instant. No more tiresome waiting time and no more inconvenience to your buyers. Each search attribute has its own specifics. The 4 options allow you to choose a suitable display mode for each product attribute. The checkbox mode will be a perfect support for multi-select options within the same attribute while swatch is the perfect choice for visualization. At the same time, product filter shows as drop-down can be used if you want to limit the option for attribute. The price filter in the default Magento 2 layered navigation is restricted in a few options of price range. Now, customers are free to filter a suitable budget limit with the support of Magento 2 Layered Navigation Multi Select. Price range slider and input box are available to help to create an ideal price filter. 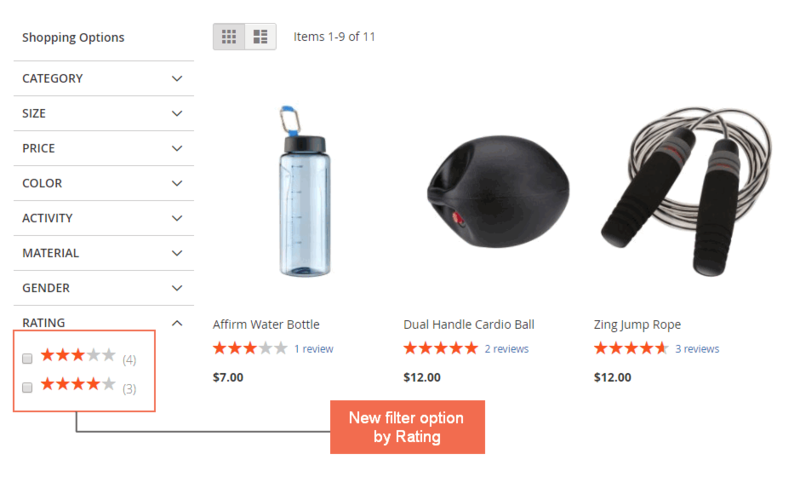 Add more advanced Magento 2 product filter options for your customer to choose. Shop by Rating feature lets buyers sorting out items from their favorite with the high popularity. Admins can enable/disable filter by rating product attribute at the backend of Magento 2 Layered Navigation Multi Select Extension. The improved Layered Navigation for Magento 2 by BSS will upgrade your default layered navigation with more advanced and tailored features. With multiple handy features of checkbox, dropdown and price range, this product filter extension will be the ideal choice for your store. 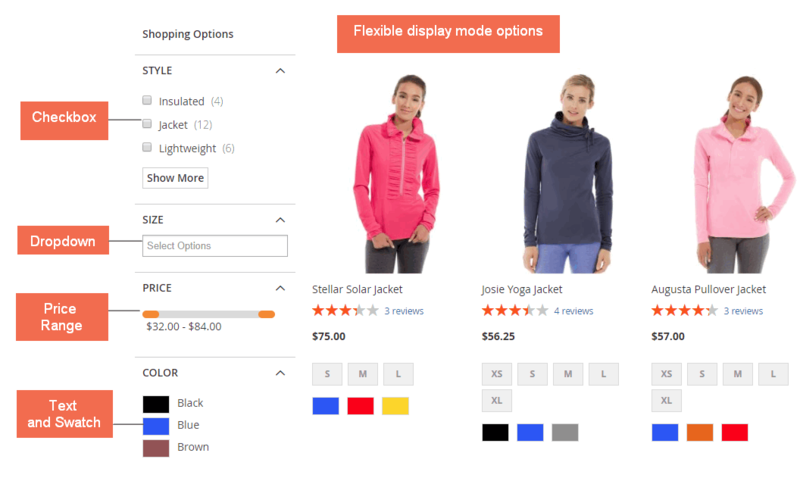 Your product filter is now enhanced with a Magento 2 Layered Navigation Multi Select Extension using AJAX. After installing Magento 2 Layered Navigation module for months, I really wanna recommend it to others as a smart product filter. Keep it up! Wanna send my thanks to customer service team as they help me out whenever I have problems with Magento 2 Layered Navigation without extra charge. Now all features are smooth as silk. Thanks again!